(Nanowerk News) Long lines at store checkouts could be history if a new technology created in part at Rice University comes to pass. Rice researchers, in collaboration with a team led by Gyou-jin Cho at Sunchon National University in Korea, have come up with an inexpensive, printable transmitter that can be invisibly embedded in packaging. It would allow a customer to walk a cart full of groceries or other goods past a scanner on the way to the car; the scanner would read all items in the cart at once, total them up and charge the customer's account while adjusting the store's inventory. The technology reported in the March issue of the journal IEEE Transactions on Electron Devices ("All-Printed and Roll-to-Roll-Printable 13.56-MHz-Operated 1-bit RF Tag on Plastic Foils") is based on a carbon-nanotube-infused ink for ink-jet printers first developed in the Rice lab of James Tour, the T.T. and W.F. Chao Chair in Chemistry as well as a professor of mechanical engineering and materials science and of computer science. 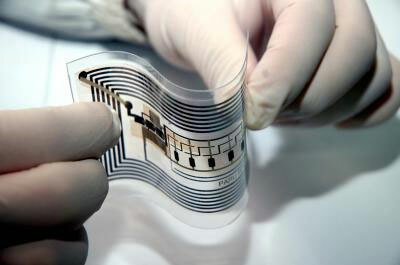 The ink is used to make thin-film transistors, a key element in radio-frequency identification (RFID) tags that can be printed on paper or plastic. "Right now, the emitter has to be pretty close to the tags, but it's getting farther all the time," he said. "The practical distance to have it ring up all the items in your shopping cart is a meter. But the ultimate would be to signal and get immediate response back from every item in your store – what's on the shelves, their dates, everything. "At 300 meters, you're set – you have real-time information on every item in a warehouse. If something falls behind a shelf, you know about it. If a product is about to expire, you know to move it to the front – or to the bargain bin." Tour allayed concerns about the fate of nanotubes in packaging. "The amount of nanotubes in an RFID tag is probably less than a picogram. That means you can produce one trillion of them from a gram of nanotubes – a miniscule amount. Our HiPco reactor produces a gram of nanotubes an hour, and that would be enough to handle every item in every Walmart.